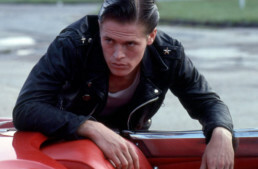 The Vintagent Classics: The films that inspired us. Run Time: 1 minute 45 sec. Key Cast: Easter Walters, Bob Tansey, 1922 Excelsior-Henderson with sidecar! Bob Tansey had a long career in films starting around 1922, when this film was made. He initially made a go of directing comedy films like this one, but found better success writing for films in the 1930s, mostly B-Westerns with Tex Ritter. Tansey’s first films ca.1922/3 are obscure today, and little is known about ‘Taken For a Ride’. 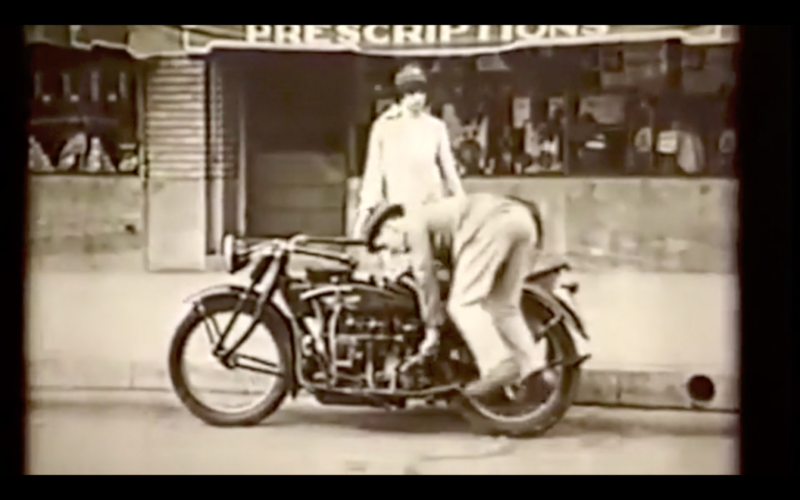 This charming short features three characters: presumed director Robert ‘Bobby’ Tansey, motorcycle stuntwoman Easter Walters, and a 1922 Excelsior-Henderson with a sidecar. These two joyriders encounter the motorcycle after bursting out of a store, and take it for a ride…but are in turn ‘taken for a ride’ by the bike with a mind of its own. 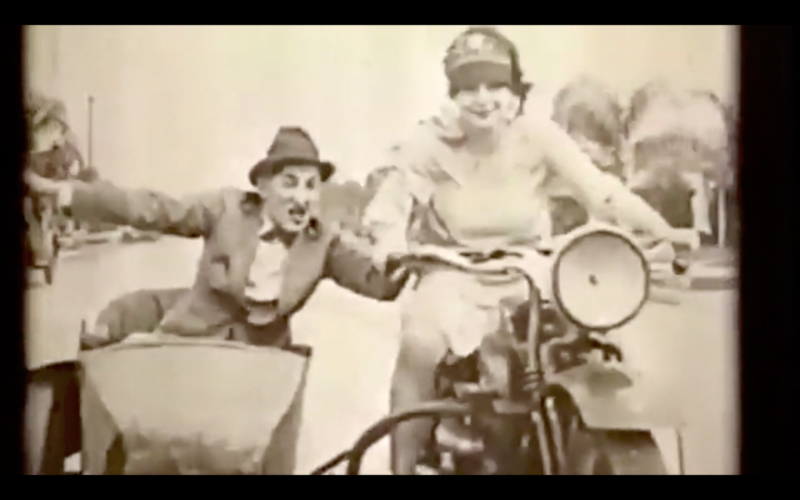 Easter Walters shows her obvious skill handling a sidecar outfit, aviating the wheel and performing tidy u-turn skids, while Tansey’s antics counterpoint her riding skill in this silent short film. 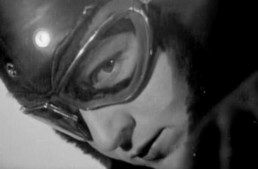 Motorcycles were primarily used for their agility and kinetic energy in early films, long before they acquired the menace of the ‘Dark Rider’ syndrome after WW2. Comics like Tansey and Buster Keaton found two (or three) wheels ideal for fast-moving stunts, and Easter Walters rode in several films, her unexpected skills at handling a big motorcycle utilized as its own thrill factor. See our article ‘The Silent Types’ for more.